This is my family's dog, Rain. "I had a good afternoon between work, especially when Rain jumped into the overflow of the retention pond and came up with a raccoon - and went about five rounds with it. No problems with her but I think the raccoon was suffering quite a bit. Talk to you later. Bye." 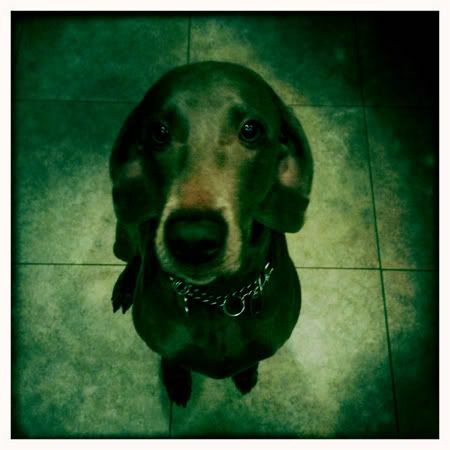 Now I love our Weimaraners, but that's why I want a small dog when I get my own pet someday. You don't have to worry about a purse-size dog trying to take down a raccoon. Eeek. That is too much for me to handle. Most of you know about our family's other dog, Hunter. The one who is 15 years old and wears diapers. 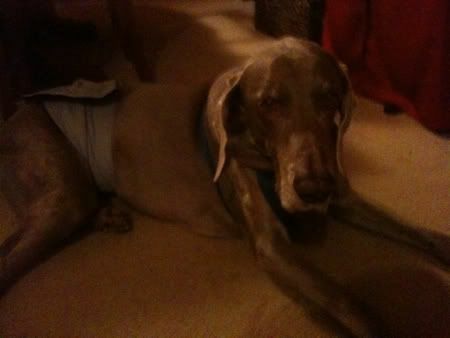 Hunter just finished his 50th session of acupuncture. The 50th one is free. Not sure about that deal. Even Chopt gives you the 10th salad free. I wonder if Hunter is the first dog to ever make it to more than 49 acupuncture sessions? I know what you might be thinking. Doggie acupuncture??? So my mom is a teeny bit over the top when it comes to her dogs. As evidenced by the whole dog water bed purchase. What can I say, she's a dog trainer by profession. February 16, 2011 by Adele Chapin.